hen I wrote on "The L-Antenna" for 10-meters a few months back, I noted that the antenna was not likely new. I have since learned that the basic idea seems to have originated with VK3AM and is described in L. A. Moxon's (G6XN) classic HF Antennas for All Locations (pp. 154-156 of the first edition). Ralph Holland, VK1BRH, includes the L in his computer study of several antennas, including an interesting variant of the L: the 1/2 wl inverted-L. (VK1BRH's interesting modeling studies, published in Amateur Radio, the journal of the Australian Wireless Association, can be found at his web site: (http://www2.dynamite.com.au/vk1brh/Antsim.htm) The inverted-L, using parallel feedline and an ATU, is an antenna with excellent potential as an all-band substitute for the 135' center-fed doublet. The 1/2 wl inverted-L differs from standard 1/4 wl inverted-Ls in 2 ways: First, it is longer, of course. Second, it is normally fed at the center. Hence, it can be viewed as an inverted Vee tilted over by 45 degrees. Alternatively, it can be viewed as a 1-leg-ground-plane 1/4 wl vertical upside down. <2') rods connected by a perimeter wire or strap that essentially surrounds the entire station location. Installation Variations Knowing that not everyone tempted to use the inverted-L will have all of the space needed, I checked some variants that represent typical construction compromises or changes. Since the antenna will be fed with parallel transmission line, matching is not a major problem. However, changes of gain and elevation angle may indicate that some variations are better than others. The elevation patterns in the figure compare the antenna at 70' and at 100' and add visual confirmation of the conclusion drawn from the table. 2. Sloping and Bending: The more normal problem for home installation is too little vertical or horizontal space. As the figure below shows, there are a number of installation "tricks" we might use. The question at hand is how much each will hurt performance. 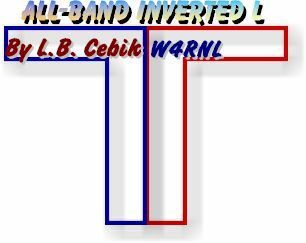 The inverted-L has the potential to be a quite satisfactory all-band wire antenna suited to certain environments. Of course, versions cut for a fundamental frequency in the 40-meter band will also work. The pattern table can be adjusted roughly by sliding the gain values and pattern descriptions down by one harmonic unit.